Selling your home is nerve wrecking. I’ve done it twice in the last five years, and I hope I’m finished with real estate transactions for the foreseeable future. With the real estate market in decline, it is more important than ever to prepare your home before you put it on the market. Decluttering has to be near the top of anyone’s to-do list and it is featured prominently on this list of 25 tips prepared by an Austin realtor. CLEAN LIKE YOU HAVE NEVER CLEANED BEFORE: This is definitely not the time for dirt, dust and grime. From bottom to top, the house needs to be spotless. From sinks to bathtubs, windows to doorknobs, attic to basement, make it immaculate. If you have to bring in a professional cleaning crew to give your home a serious scrub-down, do it. LESS IS MORE: It is a good idea to consider removing some furniture in rooms to open up more space. Buyers want to get a good feel for the layout and space within the house. Also clear countertops, shelves and corners of appliances and miscellaneous knick-knacks and clutter, to create an open, clean look. CLUTTERED CLOSETS AND OTHER STORAGE SPACES: Basements, garages and closets jam-packed with several years worth of old stuff are a big turn-off to buyers. Clean them out and rent storage space if necessary. Again, buyers expect access to the house and all the spaces within. MINIMIZE CLUTTER IN DRAWERS, PANTRIES, AND CABINETS: The same is true for these spaces. Buyers like to look everywhere! Take a look at the full list and present your home in the best way possible to buyers. It is very competitive out there and the buyers have the upper hand. If you your home isn’t in a presentable state, then the buyer will most likely look elsewhere. In this tough selling market, I would pay to have my house “staged” professionally. I have a feeling it would more than pay for itself, although my experience of it is limited to what I see on HGTV. What do you think? This is excellent information. 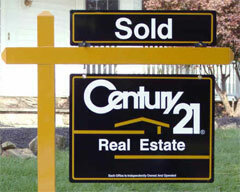 I also provide a the services of a professional stager for each of our seller clents … It makes a WORLD of difference. Excellent ideas. Also, don’t forget the exterior clutter from porches, garage and yard. Toys and tools should be neat and, of course, clean. Make sure your house smells good. Bake cookies or heat cloves in water in the microwave. Artificial odors like air fresheners and sprays usually aren’t so good. Neutral colors throughout help buyers see themselves and their furniture in your house. Sellers need to remember you don’t sell your home the same way you live in your home. You have to make changes and it really is all about perception. Unclutter: Rent a storage space. Then go through your house and put a post-it note on the items that need to STAY. Everything else should go to storage. This goes for the garage, the garden shed, and the yard. Clean Inside: After you unclutter the inside, clean it like mad. Or hire a service to do a deep clean. Clean Outside: You can get a service that will pressure-wash your drive/sidewalks, low-pressure wash your home exterior, and wash the windows. Does wonders – you’d be amazed at the grime that goes away. Clean Yard: Pay for a low-end yard service to come in and do a “yard cleanup”. They should mow, edge, trim, weed, and clear away brush. I’ve also heard you should remove most family photos so the potential buyers can see themselves living there, not you. Thanks for the link to the great list. It is a helpful perspective even if you are not selling. @Elizabeth, that’s a great link! Thanks for sharing. Professional staging can be very expensive. We had bids of $3500 – $8000 to stage our house this past winter. We chose instead to declutter and use what we had. Off-site storage was money well spent, but on moving day I pulled out an entire van-load of stuff that went to charity instead of the new house. And now that I’ve moved, I have another huge box of things to donate. I wish I’d been more aggressive about decluttering a few months ago. I completely agree that everything, inside and out, needs to be sparkling clean. After pressure-washing, our sidewalk was a whole new color. Also, if you don’t have time to strip wallpaper, paint over it. Most of our negative feedback was about wallpaper. When we bought the house, almost every room was papered. When we left, there was still paper in two bathrooms and part of the basement. Even that was too much for some people. For them, wallpaper is visual clutter. Also, remove religious artwork. I went to an open house where the living room featured a huge portrait of Jesus in a crown of thorns, with blood dripping down his face. It did not make me feel at home! I’ve been trying to sell a house this summer, and there’s another perspective, particularly in this market. Obviously everything that’s free or cheap is worth doing, but I haven’t been willing to sink in a lot of money upfront because of the chance of the house not selling this year and then being out a lot of money with no way to recoup it. My realtor told me there are some things that will almost certainly need to be done before a buyer can get a mortgage, like a new roof, but that these could be done after finding a buyer and paid for out of escrow. I think the wisdom of not spending on stuff upfront is especially wise for a house like mine, which is at the lower end of the market. My realtor is marketing it as a “light fixer.” It hasn’t sold yet, but I doubt stuff like painting would have made a difference, and following all 25 suggestions would have put me in quite a bit of debt. I love these tips. Most of them are something you could do without wanting to sell your house. Why make your house nice just before you sell it? Do it now and enjoy your hard work! What do you do when it’s your neighbor’s house that prevents yours from selling? I’ve decluttered, cleaned, keep everything nice, yet they don’t pick up their trash, have their Christmas lights still up and junk piled up around some very unkept dog kennels. I’ve filed complaints with the code enforcement, but nothings been done. Ugh, Wendy, I feel for you. I hear a lot of people complain about homeowner’s associations, but we specifically bought our house because it belongs to one and we’re able to avoid situations like yours. If you’re on good terms with the neighbors, try going over with a plate of cookies, explain that you’re in the process of selling, and they’d be doing you a great favor to have their yard tidied up. Offer to pay, if that’ll help grease the wheels. If the neighbors can’t be reasoned with, consult a good landscaping architect and try to block their house from view as much a possible. Staging is SO important! You don’t need to pay a lot – you can do most yourself if you do some research. I definitely agree with these suggestions. As a future home buyer, I’ve been casually looking, but don’t plan to buy for at least a year, the difference between cluttered and uncluttered homes is striking. The second I see clutter in a real estate listing, I immediately get turned off. It could be a great space, but clutter obscures it and makes each room look much smaller.